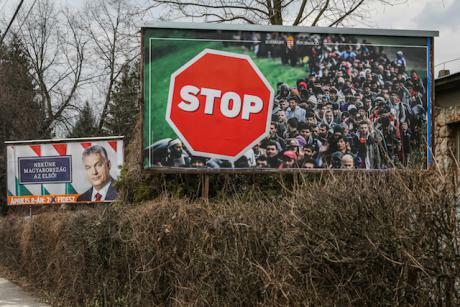 Official government anti-immigrants banner, Hungary, 31 March 2018. NurPhoto/Press Association. All rights reserved. The Netherlands, Hungary, France, Germany and Sweden: what do all of these countries, stretching across both Western and Central-Eastern Europe, have in common? They share one core uniform feature; namely, widespread patterns of electoral volatility, with a systematic electoral decline for social democratic parties in their most recent national parliamentary elections. At the start of the twenty-first century, social democratic parties governed a large swathe of countries across Europe. Fast forward to 2018, however, and now only two social democratic-style parties remain in government. In the recent national parliamentary elections in Sweden, the Social Democrats obtained only 28% of the vote, their lowest result since 1908. In Germany, the Social Democrats dropped to 17% at the polls, their worst result since 1887. A similar pattern has also occurred recently in Italy, the Czech Republic and Poland. Traditional social democratic parties in Europe are now facing electoral oblivion. Why are social democratic parties fighting for their very future and political survival? This article argues that there has been a long-term electoral decline for the centre left post-2000’s, yet the rate of decline has increased in the wake of the refugee crisis. Thus, there is a strong electoral link between the decline of social democratic parties and the ‘rise’ of populist radical right parties across Europe in the refugee crisis period. Previous research has shown that the electoral decline for social democratic parties is pronounced and has been taking place gradually over the last decade. Various explanations have been put forward, ranging from the abandonment of the working classes, to the professionalization of social democratic parties and wider processes of globalization. Recent work has also demonstrated how social democratic parties have suffered primarily from the 2008-13 economic crisis and, most significantly, the 2015-ongoing refugee crisis in Europe. The refugee crisis that began in 2015 has had a profound impact on party politics and competition across European Union (EU) member states. The crisis has created distinct electoral opportunities for populist radical right parties to ramp up the immigration issue and capture disaffected voters. The salience of the immigration issue has also increased amongst voters in a number of EU countries and has created a fertile climate in which the radical right has been able to prosper. The radical right have also been able to play up their ‘hard’ Euroscepticism card, with the EU’s institutions currently besieged by both Brexit and the refugee crisis. The recent EU summit on the refugee crisis and handling of asylum seekers have further highlighted tensions within the mainstream centre right (such as Chancellor Angela Merkel’s CDU-CSU Coalition) on how to tackle this important policy issue. This is likely to have played into the hands of radical right parties across Europe. Vacillation on the centre left has also worked to the advantage of the radical right. The refugee crisis opened up internal divisions on the centre left on the question of ongoing support of that principle. As a consequence, social democratic parties have tended to appear weak and hesitant on the immigration issue and this has benefited the radical right. A number of centre left governing parties at the start of this century were in favour of the EU’s freedom of movement principle. The case can be made that indecisiveness on the part of centre left parties is likely to have alienated traditional working class voters, leading once-strong centre left partisans to join the ranks of the radical right in recent years. The electoral decline of traditional social democratic parties has continued in the refugee crisis period and has coincided with sharp electoral increases for a number of populist radical right parties across Europe. Notable patterns here can be observed in France, Germany, the Netherlands, Austria and Italy, where the radical right have benefited considerably from the electoral slide of social democratic parties. The failure of the centre left to confront the immigration issue is arguably key in explaining their electoral slide in recent years. The radical right have played up the immigration issue and adopted hard-line stances on the issue that have resonated well with disaffected working class voters. In contrast, social democratic parties have tended to downplay the immigration issue in this electoral period and this has played into the hands of the radical right. This pattern is likely to continue in the coming future and means that the very future of social democratic parties is under threat. Of the recent national parliamentary elections that have taken place in 2017 and 2018, it is striking that in five countries where social democratic parties were incumbents, only one party (the much weakened SPD in Germany) has remained in coalition government with Merkel’s centre right CDU-CSU coalition. The recent election in Sweden also illustrates this broader macro-political pattern across contemporary European politics, with the final coalition arrangement yet to be decided. Back in the early 2000’s Sweden was considered a unique case, one where the radical right had received little or no electoral support. It is a measure of how times have changed to note that the radical right Swedish Democrats are now the third biggest party in Sweden. In Italy and Austria, radical right parties have also now entered into coalition government. The case of Italy shows how the radical right League have become even more popular amongst voters after entering government with the ‘catch-all’ Five Star Movement Party. The electoral ‘rise’ of radical right parties should be seen as a significant threat to mainstream social democratic parties across Europe. Yet comparatively, centre right parties do not appear to be under as much of a threat on the immigration issue as the centre left are. Political commentators often speak about how support for the radical right is a flash in the pan movement and comprises a ‘protest vote’. However, this is no longer the case and the discourse of the radical right is now increasingly entering the mainstream of contemporary party politics in Europe. It is now looking increasingly likely that this analysis is incorrect. We may only be at the beginning of the populist radical right surge in European politics. © James Downes. Views expressed on this website are individual contributors and do not necessarily reflect that of the Centre for Analysis of the Radical Right (CARR). We are pleased to share previously unpublished materials with the community under creative commons license 4.0 (Attribution-NoDerivatives).